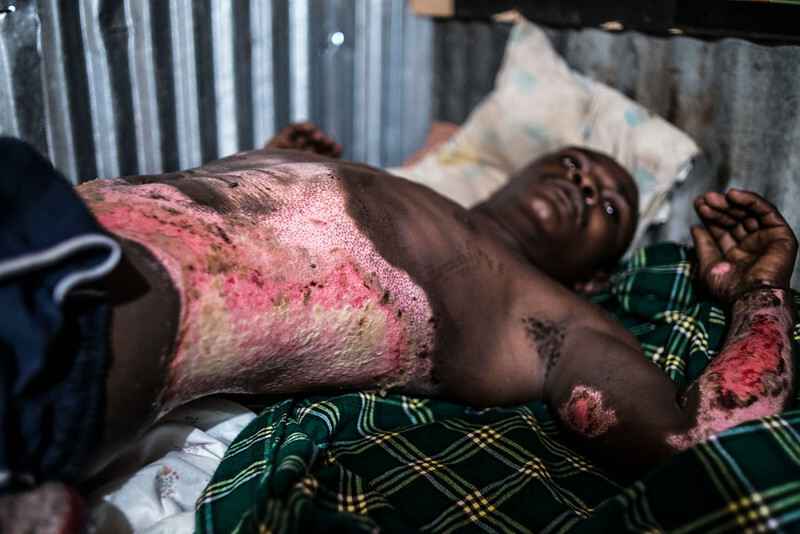 Boniface Mwangi, 29, recovers from burns in his shack in Nairobi's Mukuru Kwa Njenga slum on Monday, May 11, 2015. Mwangi was accused of stealing a cell phone near his home on April 23. After being released by police, he found 10 men waiting for him near the police station. 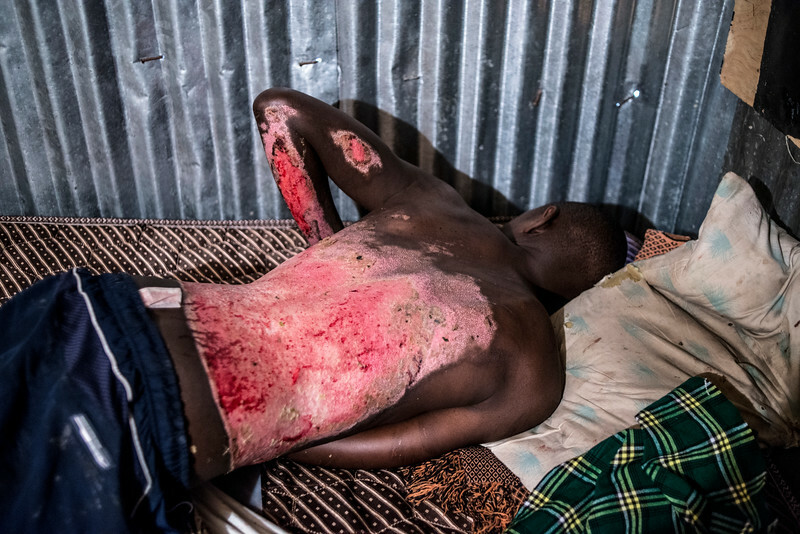 They beat him, doused him in petrol, set him ablaze and left him to burn to death. 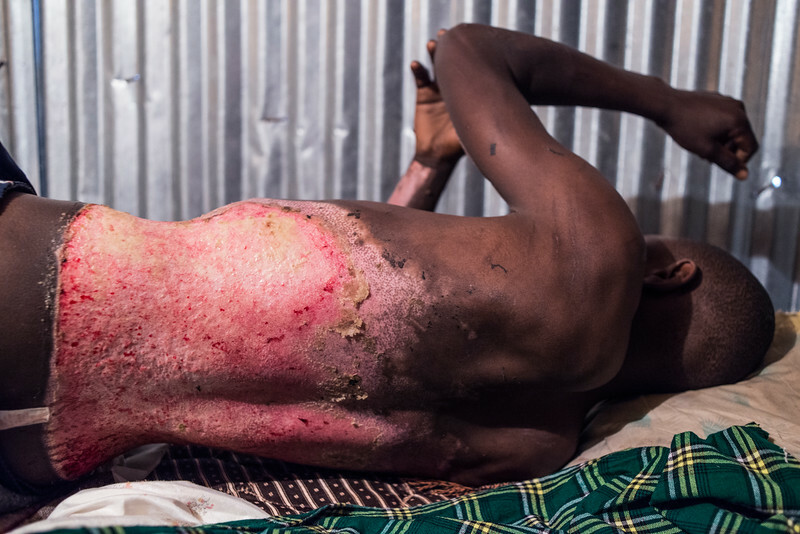 Mwangi rolled into a sewage ditch to suffocate the flames. 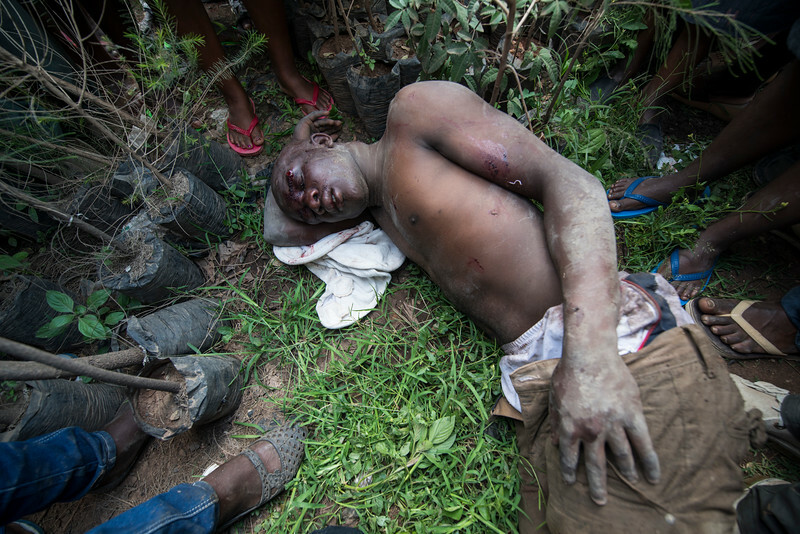 Mob justice is common in Kenya's slums because residents believe police protect criminals for kickbacks. 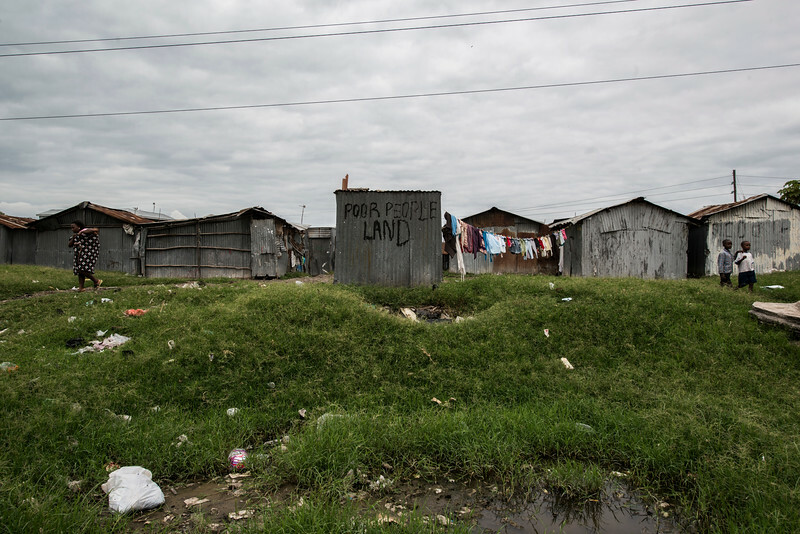 A sign that reads "Poor People Land" adorns a shack on the outskirts of Nairobi's Mukuru Kwa Njenga slum on Sunday, May 17, 2015. 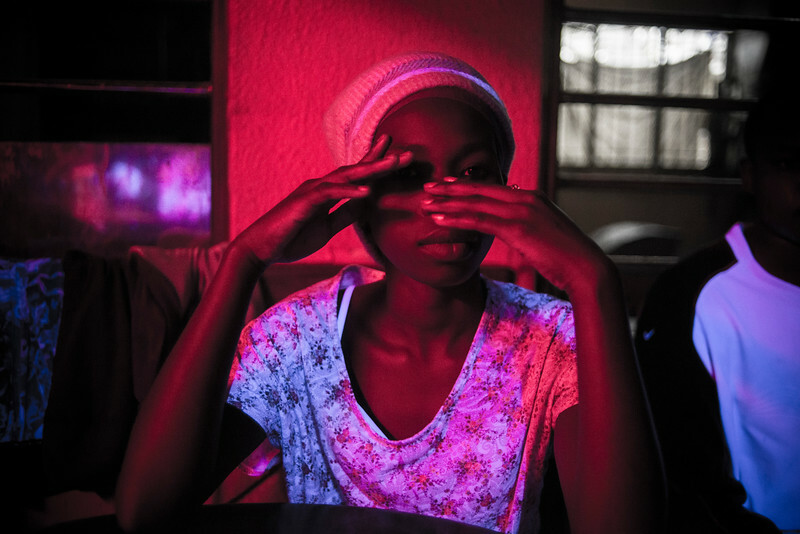 Lavenda Odire, a prostitute, searches the crowd for a potential client at the Great Batis Club in downtown Nairobi on Wednesday, April 29, 2015. 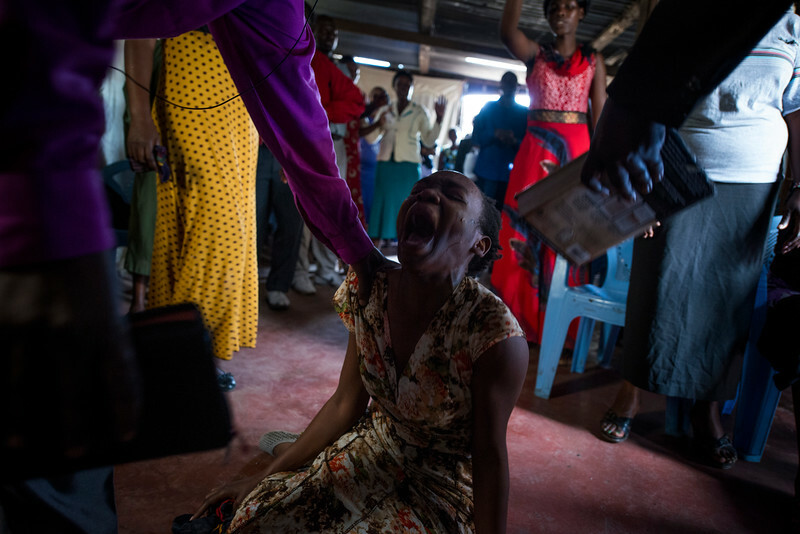 Beatrice Auma Opondo takes a blessing by the two pastors of the Jesus Annointing Ministry Baptist church in Nairobi's Soweto slum on Easter Sunday, April 5, 2015. Beatrice traveled to the slum church from after her husband sent her and their four children away. Lacking money or a place for her to stay, the church offered to "save" her again. 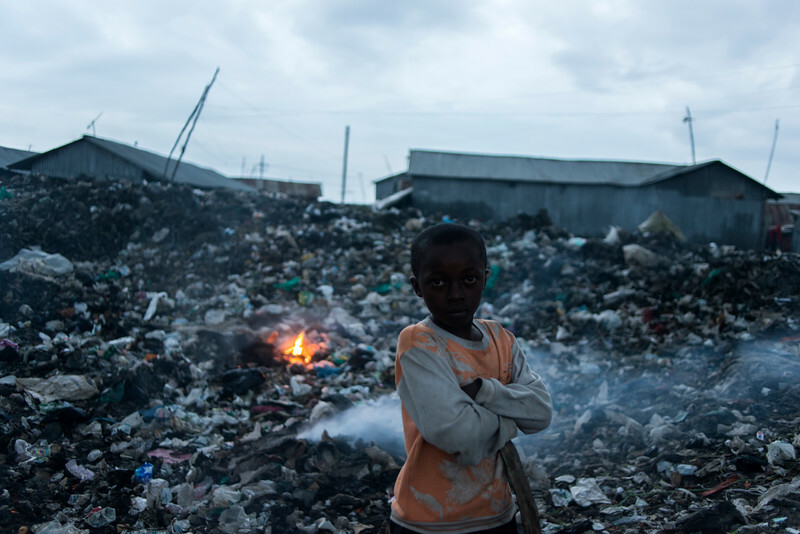 A boy burns his family's garbage in Nairobi's Mukuru Kwa Njenga slum on Friday, May 29, 2015. 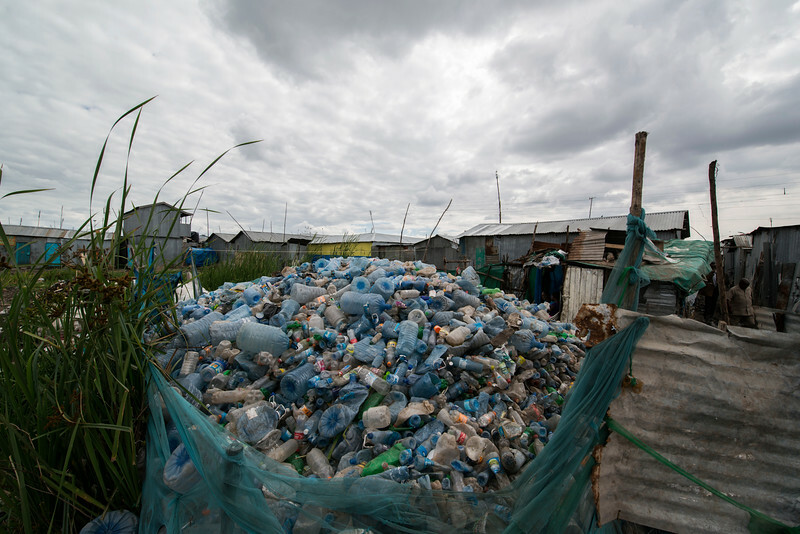 Irregular trash pick-up and general lack of city sanitation services have contributed to widespread outbreaks of cholera and parasites like jiggers, bedbugs and lice. 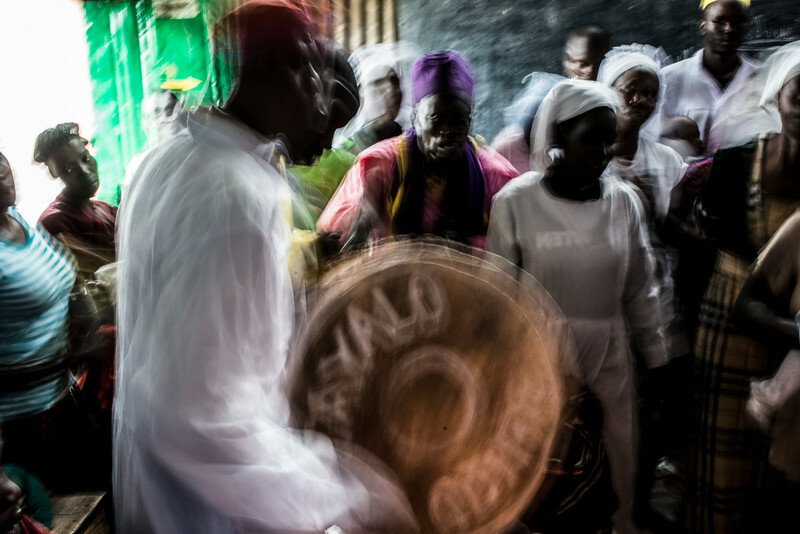 Filusters Miskei attends the Jesus Annointing Ministry Baptist church in Nairobi's Soweto slum on Sunday, April 12, 2015. School children watch as a laborer in Kayole's soweto slum poses for a photo on his lunch break on Wednesday, May 27, 2015. Children's school fees are usually the first expense cut by jobless men in the slum. Widespread unemployment in east Nairobi has come to mean most children begin adulthood with an 8th grade education or less. 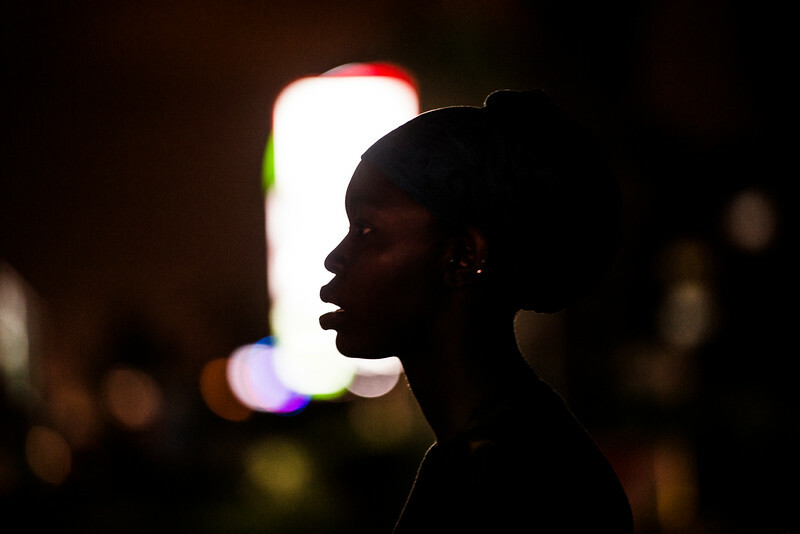 Gloria Khadesa, 20, walks the outer ring road in Nairobi's Embakasi district looking for customers on Friday, May 8, 2015. Gun runners wait to hand off two pistols at a remote lot in east Nairobi on Tuesday, June 16, 2015. 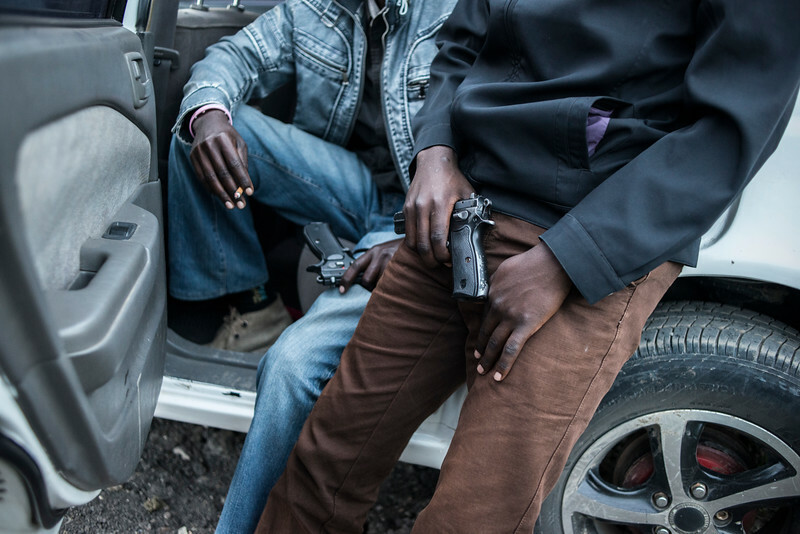 Renting illegal guns for armed robberies is a large part of the Kenyan capital's slum economy. Robbers pay a ring leader, who owns the weapons, a portion of their nightly spoils. Ring leaders demand loyalty and secrecy but in this culture money talks. These two exposed their weapons for a photo for $150.00. 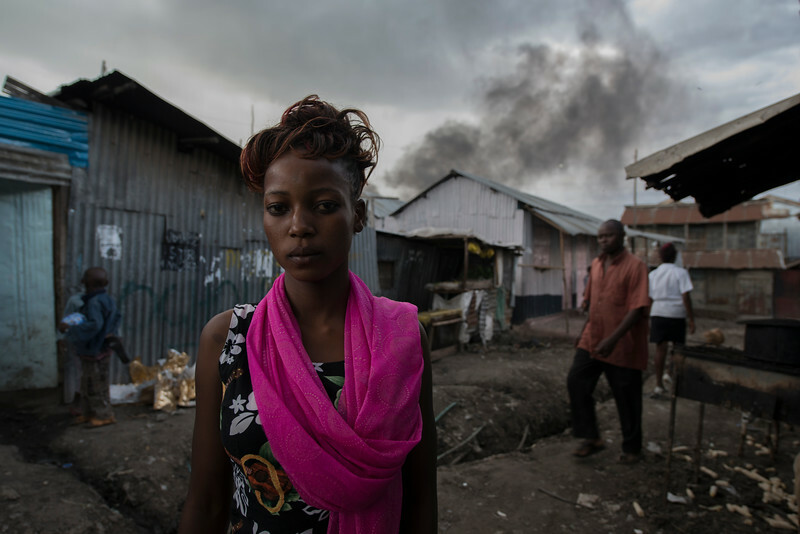 Victoria Mwangeli, 21, a prostitute, prepares to entertain a customer at her home in Nairobi's Mukuru Kwa Njenga slum on Friday, April 24, 2015. 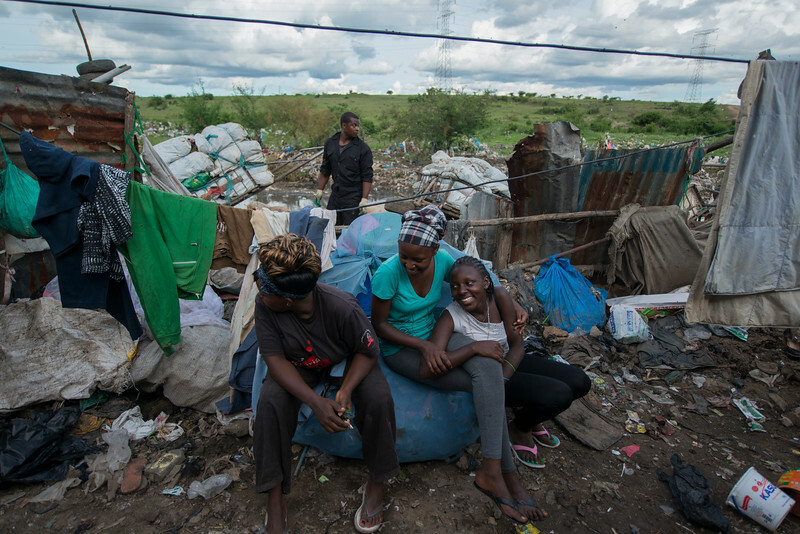 According to local activists, young women turning to prostitution for work and the spread of HIV in the Eastland slums reached an all time high this spring. 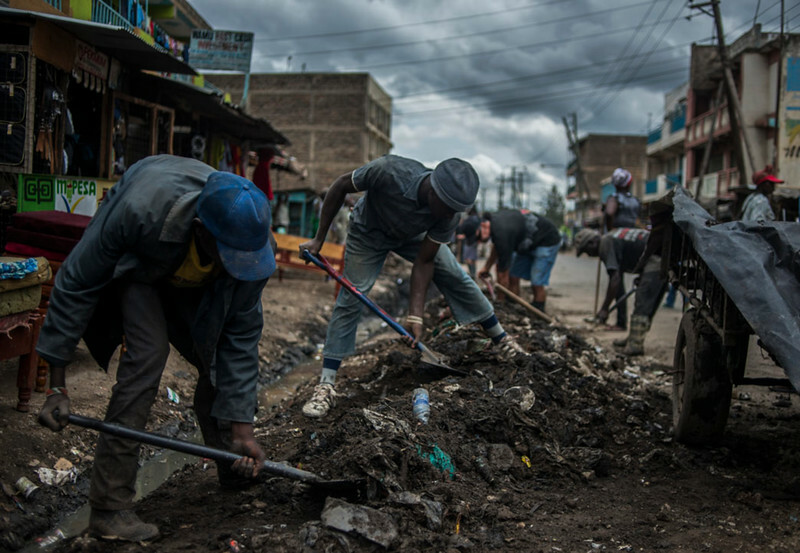 Members of Kayole Mtaa Safi, a local environmental non-profit, shovel trash away from a clogged sewer in Nairobi's Kayole district on Thursday, May, 7, 2015. The organization recruits idle youth and recovering criminals for street clean-ups and trash pick-ups throughout the district. Sewer clean-ups like this one are the groups response to the rash of cholera outbreaks that have killed dozens since April. 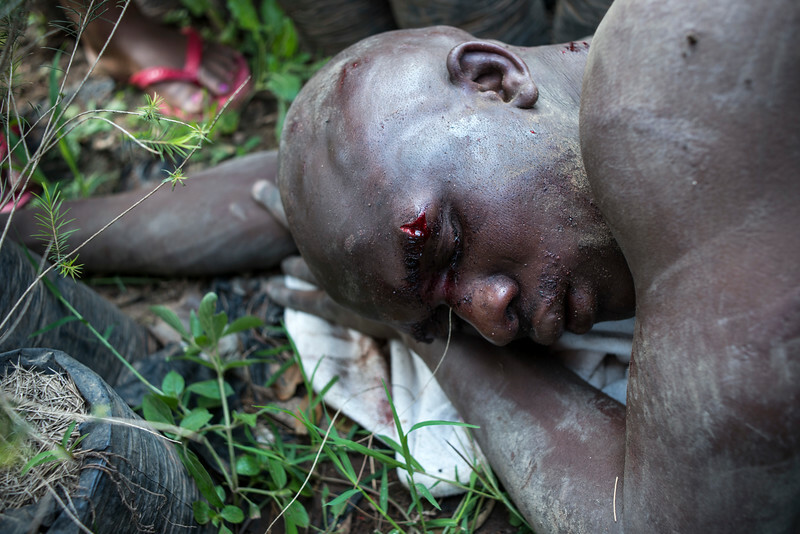 People gather around an unconscious Teddy Oweno after he was surrounded, stripped and severely beaten by a mob on the afternoon of Wednesday, May 21, 2015 in Nairobi's pipeline area. Oweno was accused of being a thief and attacked in broad daylight by more than 20 people while police stood by less than 50 meters away. After his assault, onlookers peeled him off of the median and put him in a cab. A bloodstain and a baseball cap mark the place where the head of 16-year-old boy rested when police arrived to move his lifeless body on Thursday, May 7, 2015. 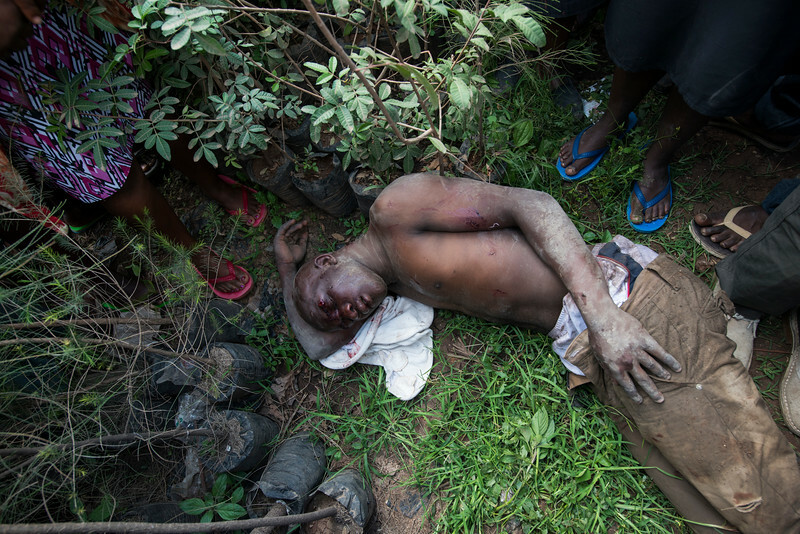 The night before, the boy was stoned to death for theft by a mob in Nairobi’s Kayole district. Reports on what was stolen varied. Some said the boy took a small amount of grocery money, others said it was a cell phone. 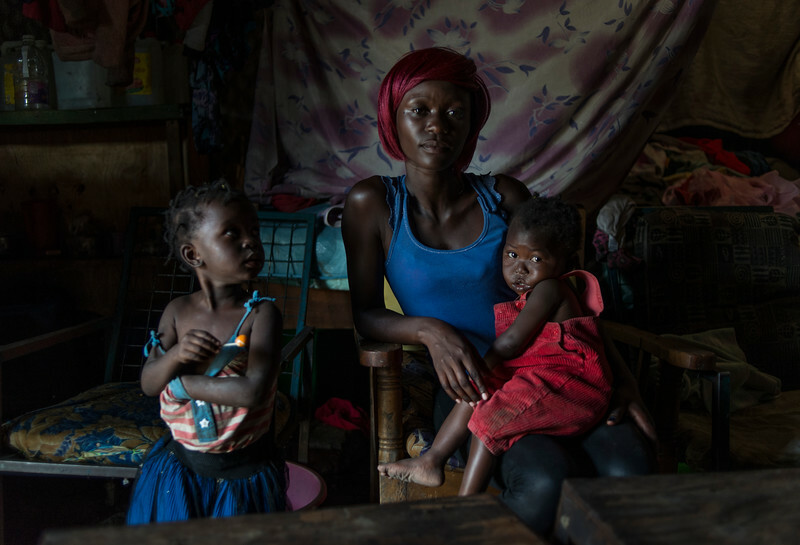 Scarlett Atieno, 3, left; Diana Atieno, center; and Ashley Atieno, 1, in red, pose for a photo in their ramshackle home in Nairobi's Mukuru Kwa Njenga slum on Thursday, April 23, 2015. Atieno prostitutes herself five days a week for less than $2.00. 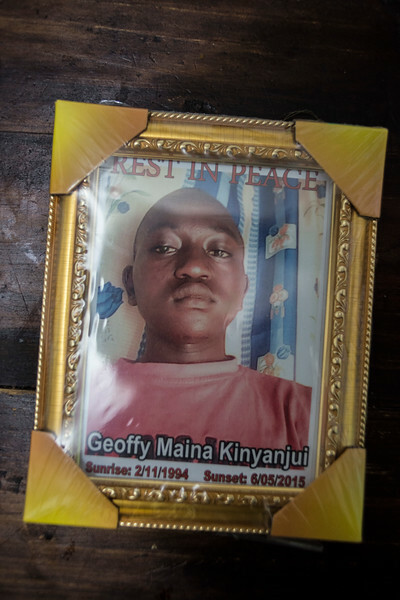 A portrait of Geoffy Maina Kinyanjui, commemorating his death by mob stoning earlier this month, adorns a coffee table at his cousins home in Nairobi's Kayole district on Tuesday, May 19, 2015. 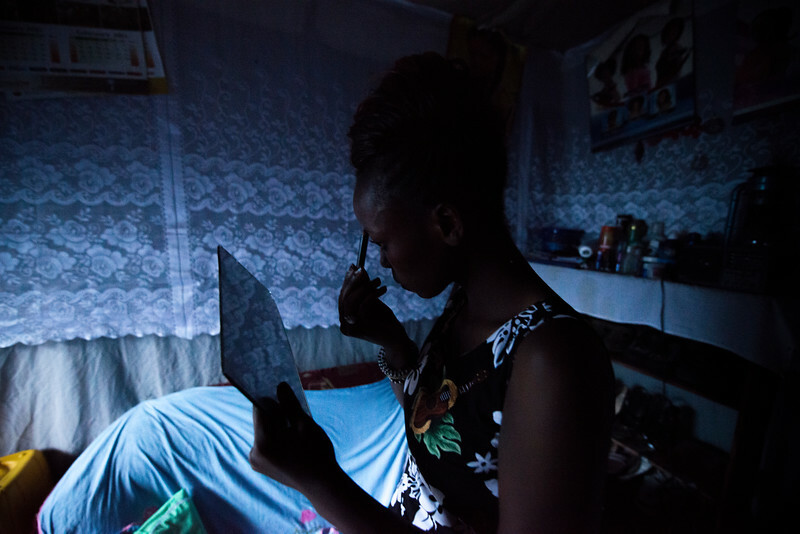 Maureen Mueni, 20, applies make-up in her ramshackle home in Nairobi's Mukuru Kwa Njenga slum on Thursday, April 23, 2015. Mueni prostitutes herself five days a week for less than $2.00. 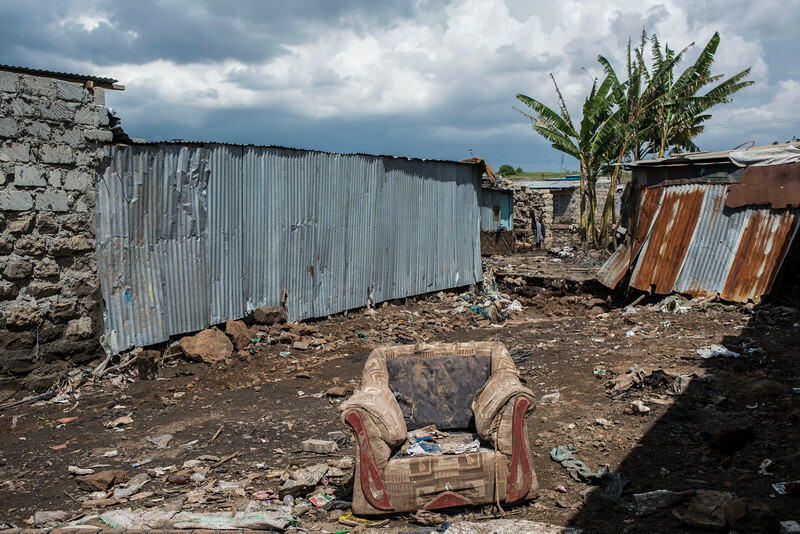 An armchair is all that is left of a livingroom in Nairobi's Kayole slum on Thursday, May 14, 2015. 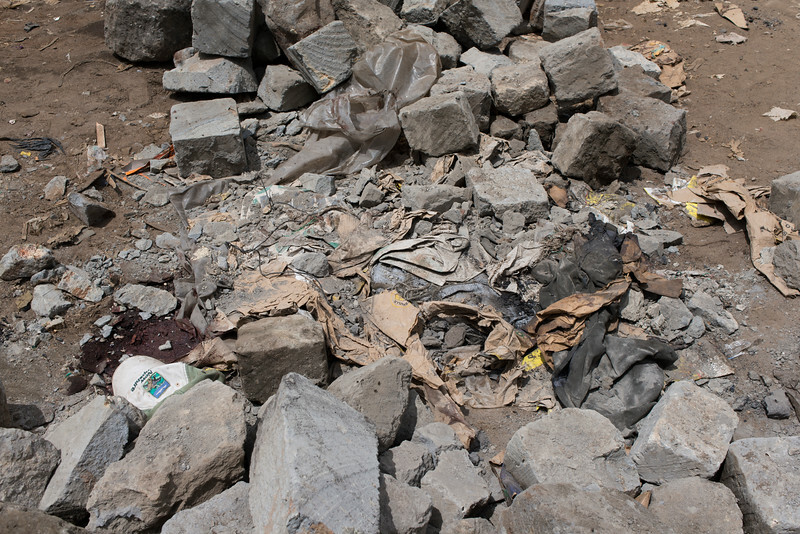 Recent rainy-season flooding destroyed several of the ramshackle squatter homes in the area. 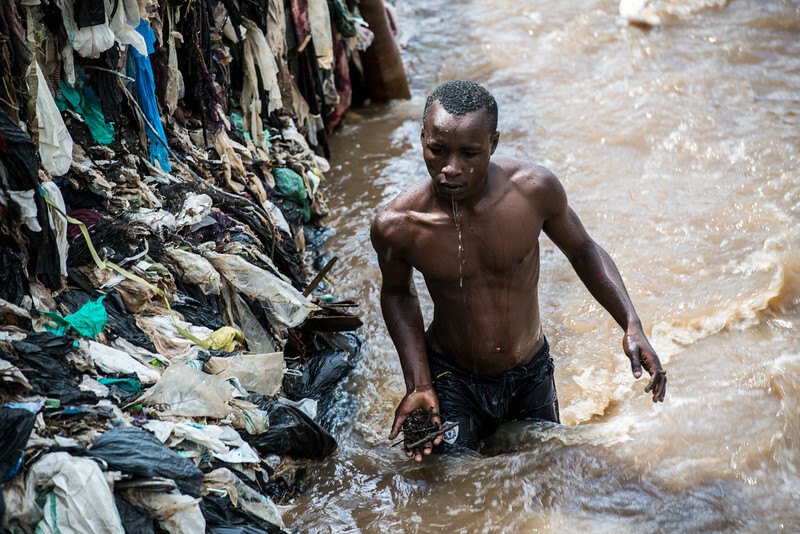 At the edge of a massive island of garbage, man dives into a polluted river looking for scrap metal to resell in Nairobi's Kayole slum on Thursday, May 14, 2015. Residents have turned the area into a garbage dump and recycling center. Chickens peck for insects in a home destroyed by a rainy season flood in Nairobi's Kayole slum on Thursday, May 14, 2015. 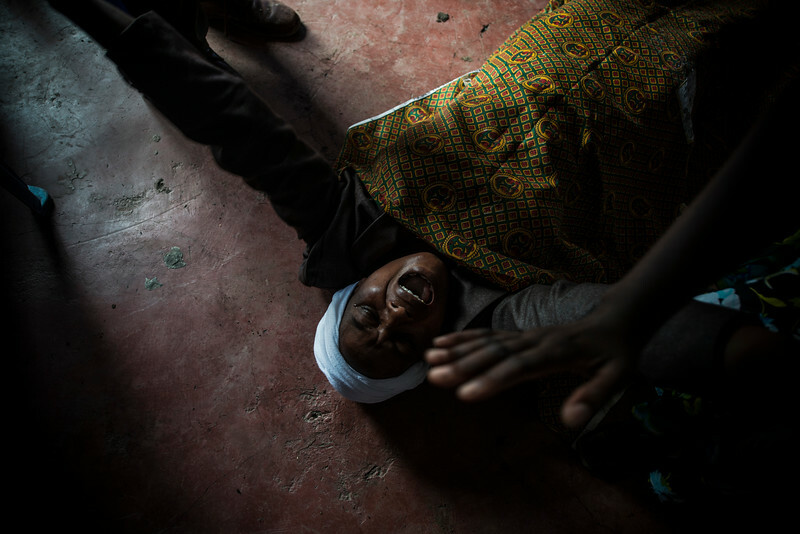 A street shoe vendor leaves his stand unattended to say a quick prayer at the Jesus Anointing Ministry Church in Nairobi's Soweto Slum on Sunday, May 3, 2015. 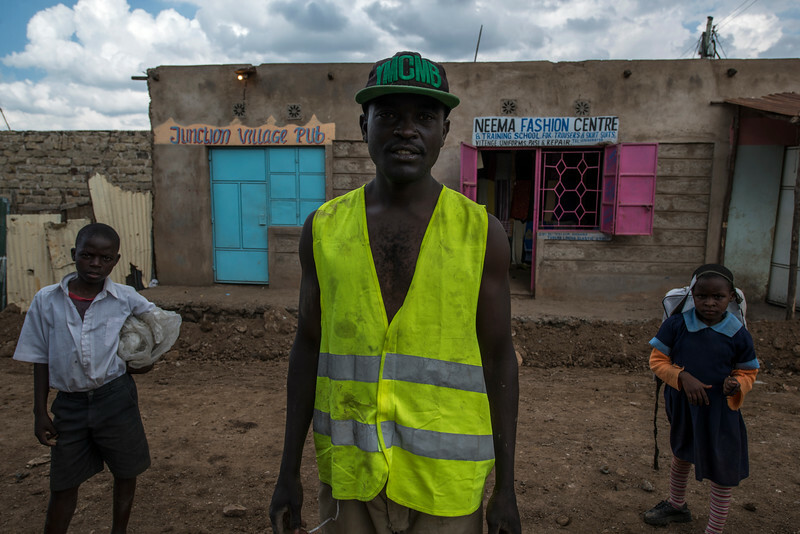 Christian faith and second-world-money-grab culture infuse the environment in Nairobi's poorest areas. 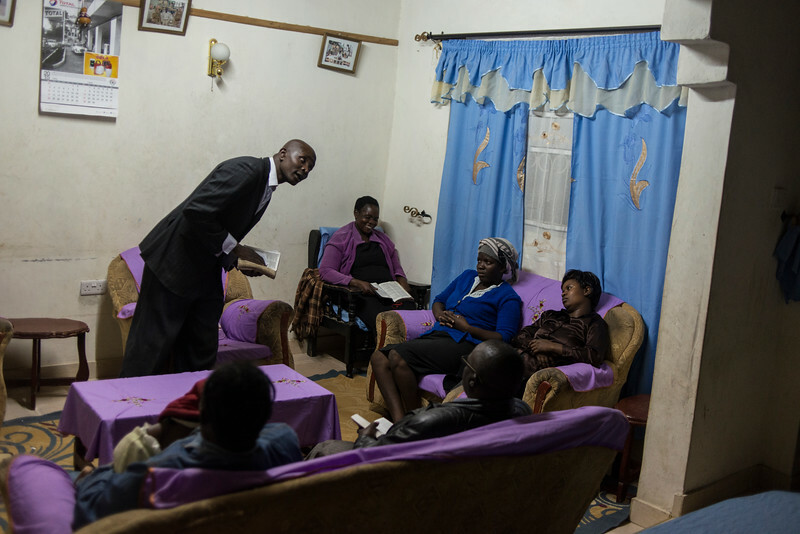 Nelson Murage, a pastor-for-hire, holds a private prayer ceremony in Nairobi's Embakasi district on Tuesday, May 5, 2015. Many in eastern Nairobi see becoming a pastor as way to make a profitable living. 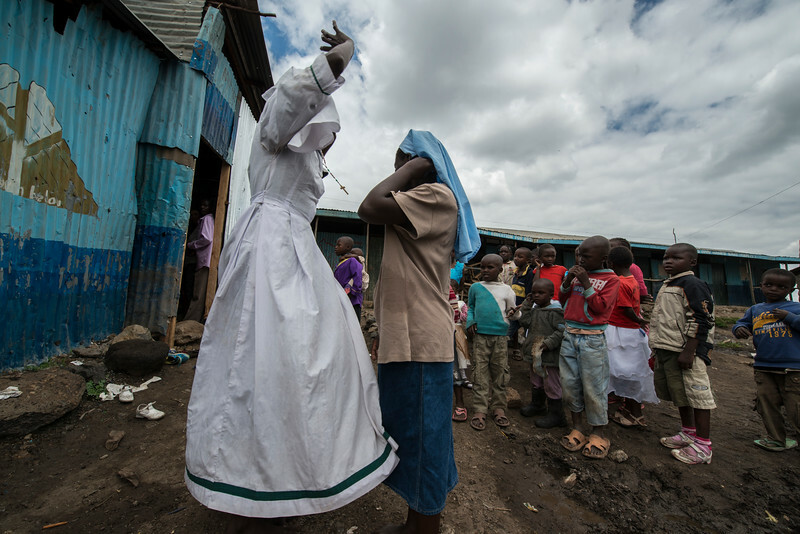 Rosemary Odhiambo, a member of the Legio Maria church, reaches for the sky during an outdoor blessing in Nairobi's Mukuru Kwa Njenga slum on Sunday, May 17, 2015. 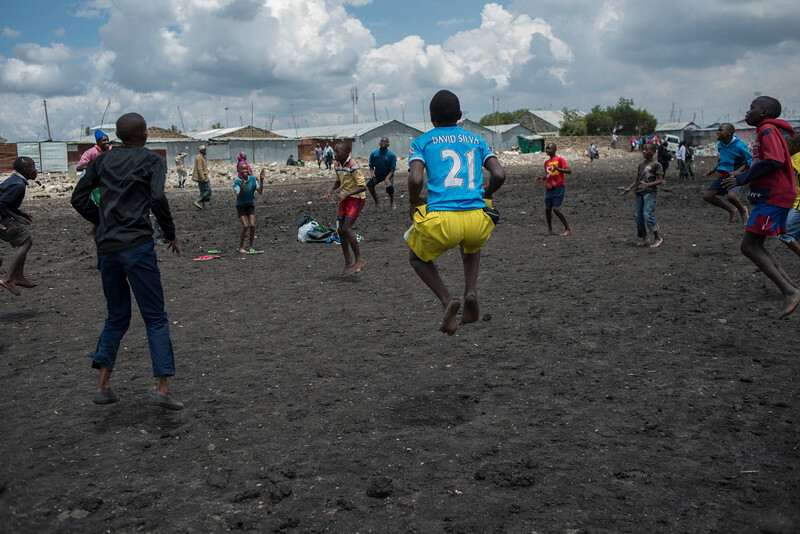 With their playing field flooded by spring rain, captain Brian Muge, 14, in red shorts, leads the Gateway Football club in training drills on a dry patch of Nairobi's Mukuru Kwa Njenga slum on Saturday, April 5, 2015. 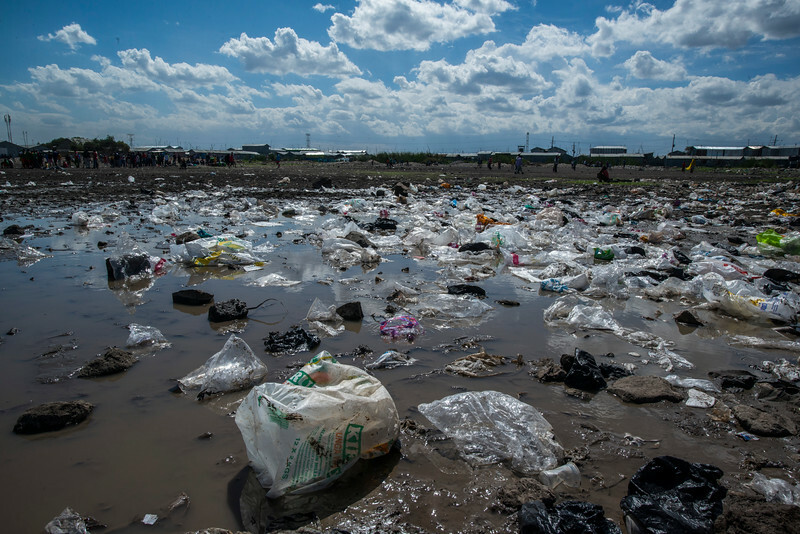 Contaminated water gave way to a sea of trash on Friday, April 10, 2015, uncovering the soccer field in Nairobi's Mukuru Kwa Njenga slum. 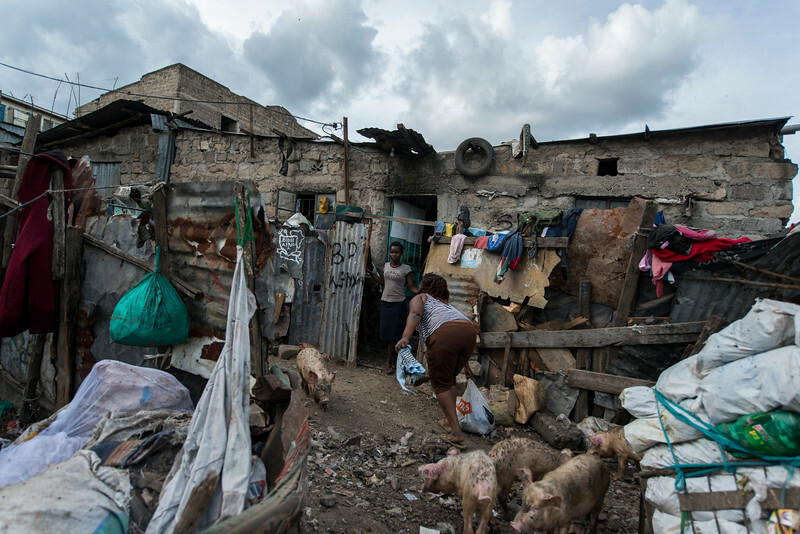 Improper drainage and sewage leaks have since April led to a series of cholera outbreaks that have killed 40. An island of trash floats in the river in Nairobi's Kayole slum on Thursday, May 14, 2015. Residents have turned the area into a garbage dump and recycling center. 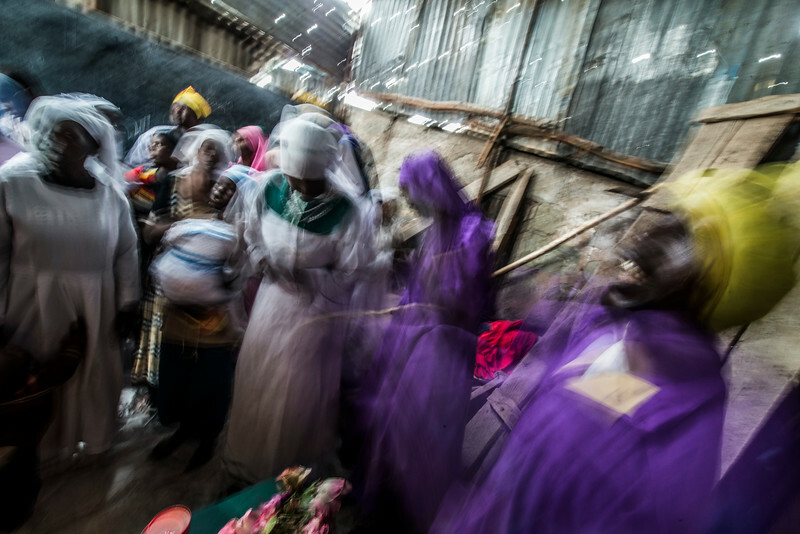 Members of the Legio Maria church dance during a service in Nairobi's Mukuru Kwa Njenga slum on Sunday, May 17, 2015. 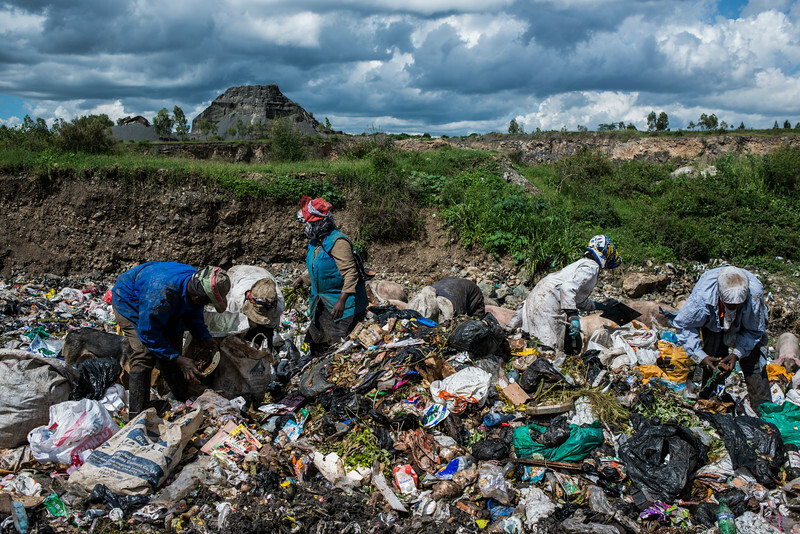 A women pick piles of trash in Nairobi's Kayole slum on Thursday, May 14, 2015. Residents have turned the area into a garbage dump and recycling center. Recyclables are sold for profit. 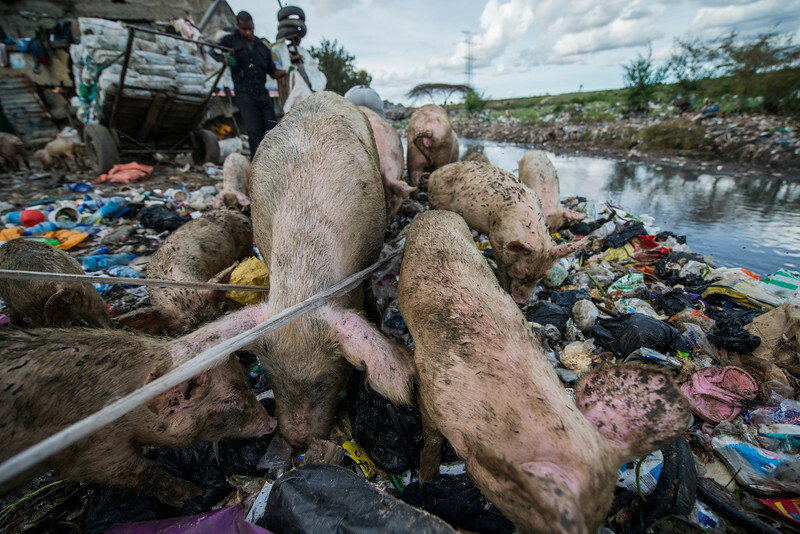 Pigs feed on organic waste at the ramshackle recycling center in Nairobi's Kayole district on Thursday, May 7, 2015. Slum residents cut a living by collecting garbage, separating it and reselling plastics and metals. Food waste is fed to pigs that are later sold to butchers. 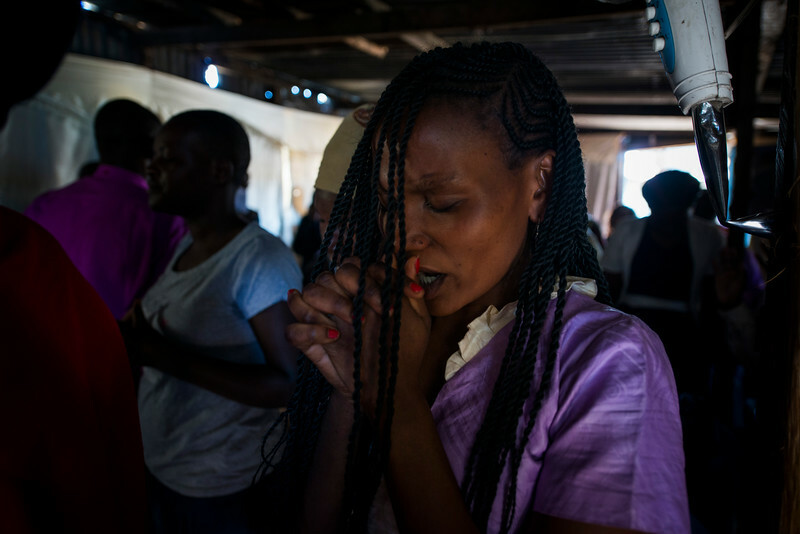 Jane Sayeme feels the touch of God at the Jesus Annointing Ministry Baptist church in Nairobi's Soweto slum on Easter Sunday, April 5, 2015. Many unemployed Kenyans, unable to rely on family or the government, look to churches for charity and a way out of poverty. 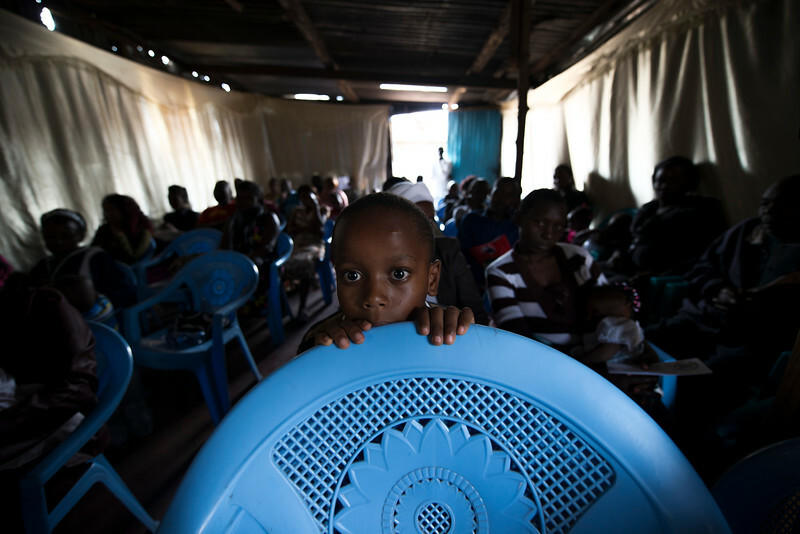 A young boy is transfixed by Pastor Habel Okalo's loud and theatrical sermon at the Jesus Annointing Ministry Baptist church in Nairobi's Soweto slum on Easter Sunday, April 5, 2015. Many Kenyans, unable to rely on family or the government, look to churches for charity and a way out of poverty. 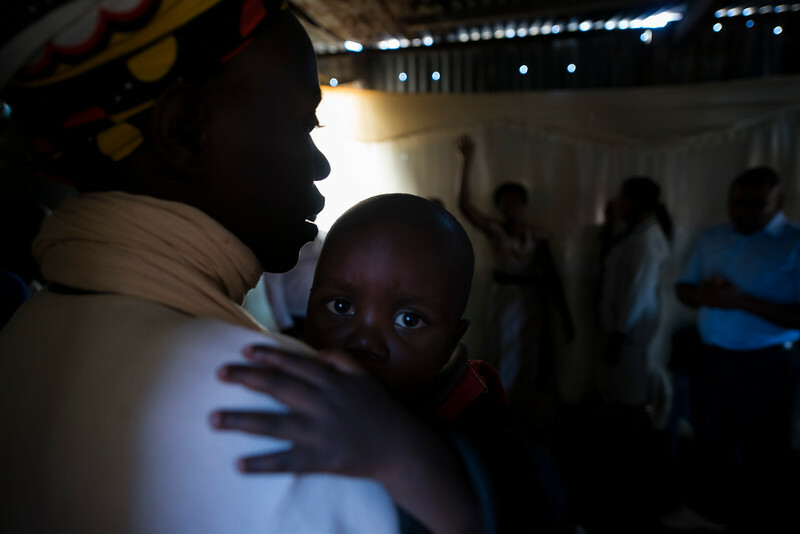 A mother and child attend the Jesus Annointing Ministry Baptist church in Nairobi's Soweto slum on Sunday, April 12, 2015. 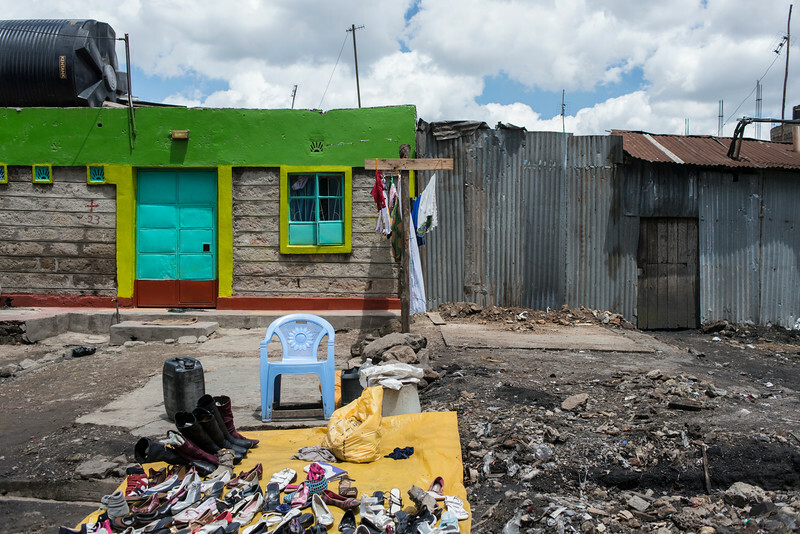 Janenyvive Natali Dave stands in the doorway of her home in Nairobi's Kayole district slum on Thursday, May 7, 2015. Slum residents cut a living by collecting garbage, separating it and reselling plastics and metals. Food waste is fed to pigs who are sold for meat. 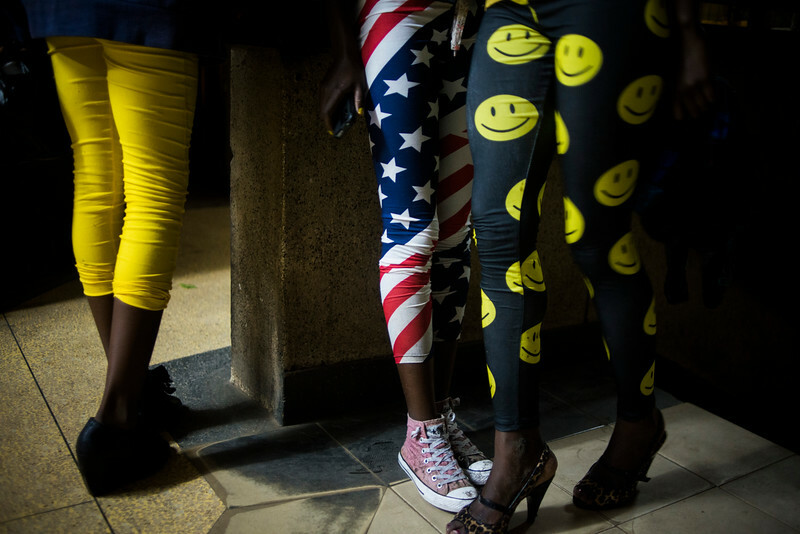 Prostitutes gather at a club in downtown Nairobi on Wednesday, April 29, 2015. Maureen Mueni poses for a photo near her ramshackle home in Nairobi's Mukuru Kwa Njenga slum on Thursday, April 23, 2015. Mueni prostitutes herself five days a week for less than $2.00. 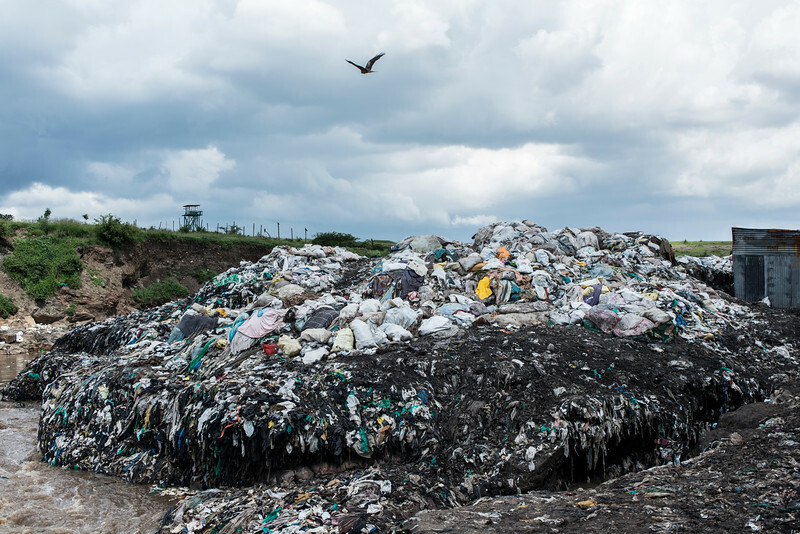 A mound of plastic bottles sits on the outskirts of Nairobi's Mukuru Kwa Njenga slum on Sunday, May 17, 2015. Several giant trash piles created during local clean-ups sit idle near area homes, schools and businesses. City trucks often take months to move trash in Nairobi's poor areas. A young girl gets her first weave in the heart of of Nairobi's Mukuru Kwa Njenga slum on Monday, April 6, 2015. 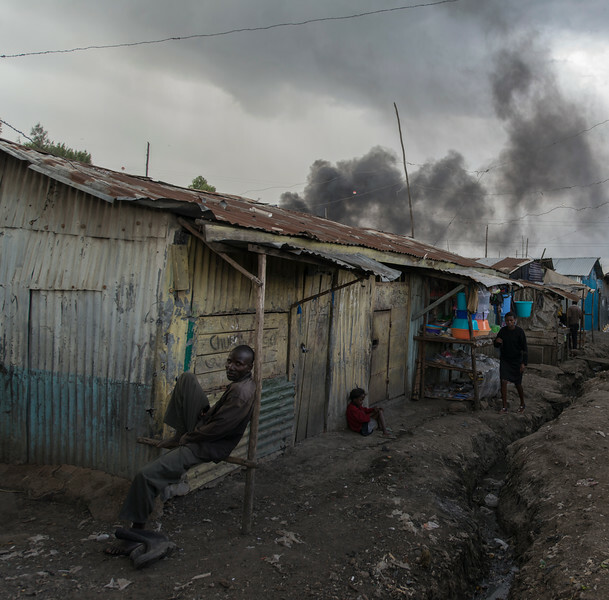 A man rests in Nairobi's Mukuru Kwa Njenga slum on Thursday, April 23, 2015. Behind him smoke from a garbage fire floats over head. 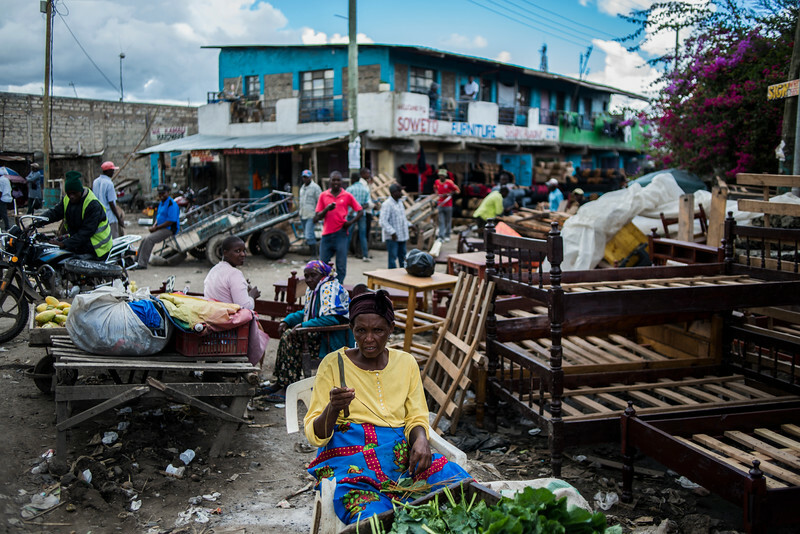 A vegetable seller in Nairobi's Soweto slum reminds me that pictures should be paid for on Tuesday, May 5, 2015. "Hakuna cha bure hapa Soweto ," she said. A boy and girl venture out of their makeshift home across the street from the Jesus Anointing Ministry Church in Nairobi's Soweto Slum on Sunday, May 3, 2015. 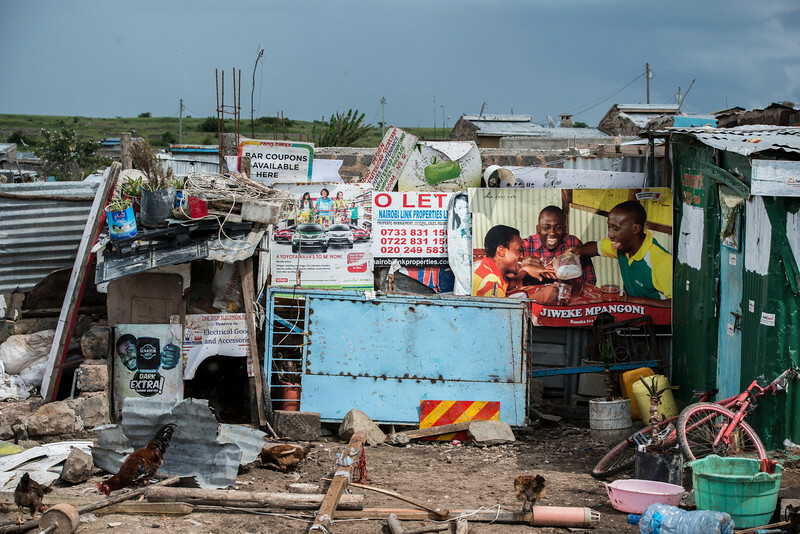 Bereft of government assistance, Kenya's poorest areas rely on churches for shelter and assistance. After services, the pair visited the pastor for money for food. 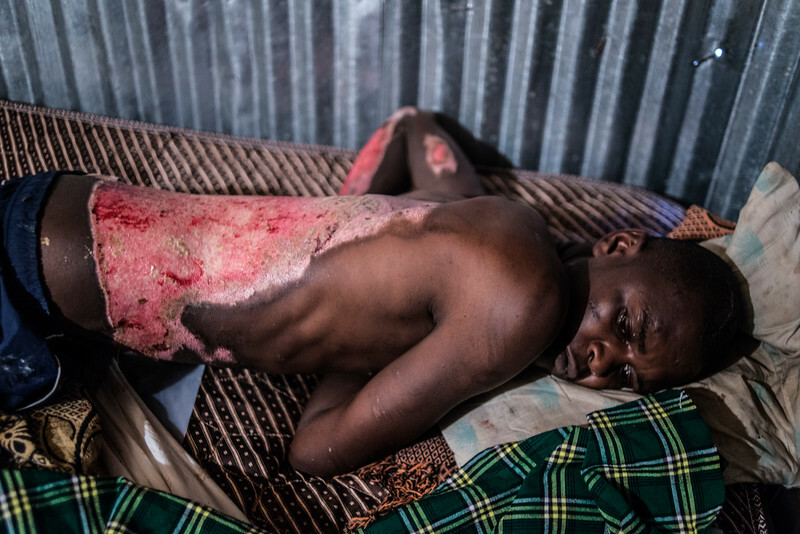 Boniface Mwangi, 29, recovers from burns in his shack in Nairobi's Mukuru Kwa Njenga slum on Monday, May 11, 2015. Mwangi was accused of stealing a cell phone near his home on April 23. A mob quickly formed and beat him severely before it was broken up by police. Later that day, Mwangi was released from police custody to find 10 men waiting for him near the police station. 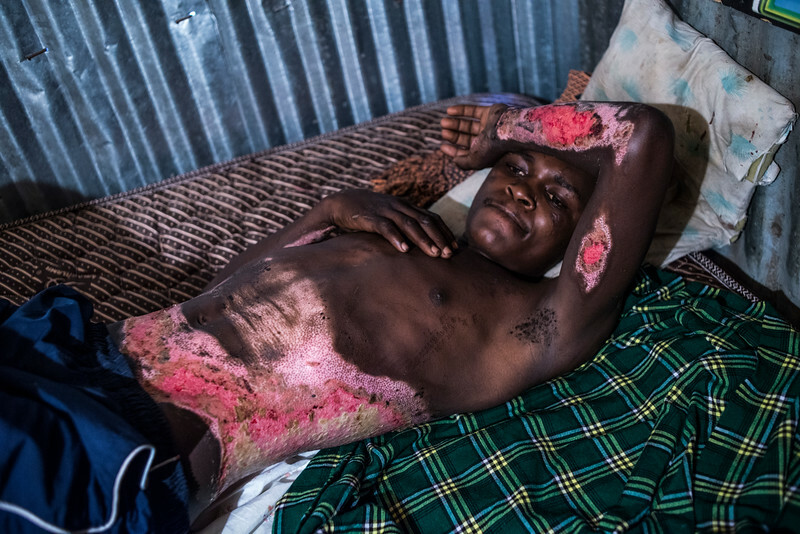 They beat him again, doused him in petrol, set him ablaze and left him to burn to death. Mwangi rolled into a sewage ditch to suffocate the flames. 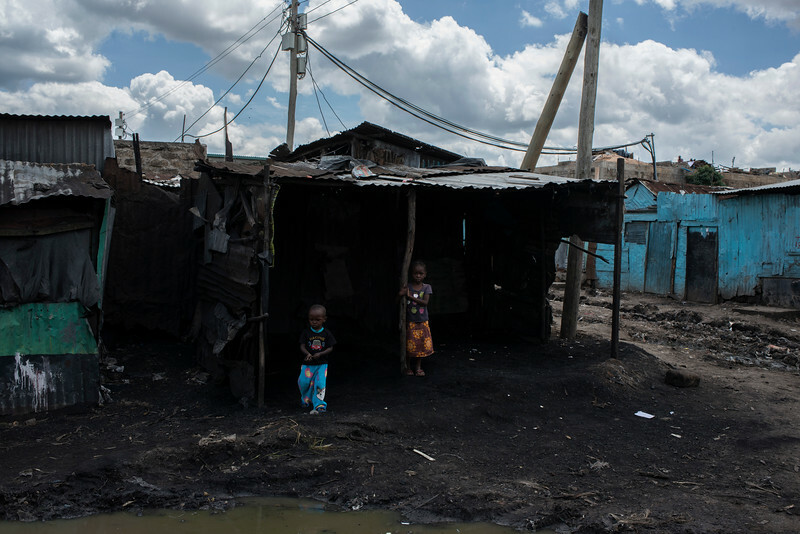 Mob justice is common in Kenya's slums because residents believe police protect criminals for kickbacks. 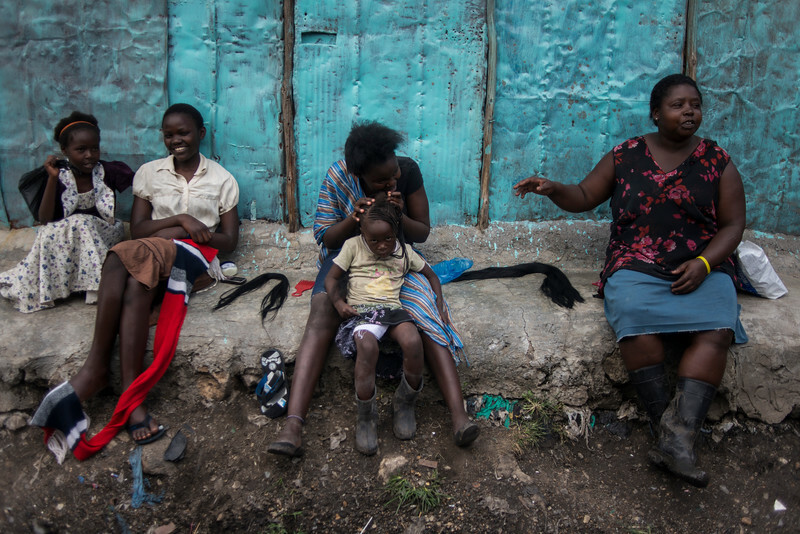 L-R, Njeri Kinyanjui, Mary Waithira and Caroline Nduta take a break from recycling in Nairobi's Kayole district on Thursday, May 7, 2015.